Home fries are quick and easy to make, they’re filling and make a great accompanyment to a lot of different dishes. In North America, just about every restaurant has their different recipe for making home fried potatos and they’re often served with breakfast. You’ll also need the following ingredients for your home fries. You can get creative and add things like chopped onions and garlic or extra spices for added flavor, but we’ll stick with the basics below for now. Peel your potatos first, or if they have a thin clean peel, you can wash and scrub them really well and leave the peel on. Then cut them up into cubes of about a half inch (1 cm.). Rinse them under cold tap water and drain and dry them with paper towels. In your skillet, add enough oil to barely cover the bottom. Turn the heat up to about medium high and once theoil is hot, put in your potato cubes. Give them a good stir immediately so they don’t stick. Then put the cover on the skillet, turn the heat down to medium and let them cook for about 6-8 minutes. Turn your home fries and then put the lid back on for another 6-8 minutes so they cook thrroughly. Next, add salt and pepper to taste and poke a couple of the largest cubes with a fork to see if they’re fully cooked. 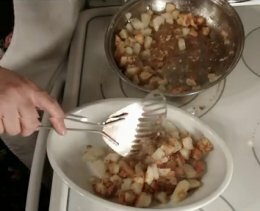 If the home fries are not fork-tender, put the lid back on for another 2-3 minutes. When the home fries are fully cooked and ready to serve, scoop them out onto a paper towel to blot any excess oil and serve. I usually add some butter to my oil, some chopped onions and garlic and sometimes even green and red pepper for extra flavor, but you can add just about anything you prefer. The trick is to make sure everything is cut up the same size so it all cooks evenly.